The 1421 theory claims that the Chinese (specifically, the fleet of the admiral Zheng He) reached the Americas in 1421 — before Christopher Columbus, and that various Native American peoples descend from the Chinese and speak Chinese. Historians generally regard the 1421 theory as pseudohistory based on nothing more than speculations, assertions, and sloppy research. “”The Tartar Chinese speak the dialect of the Apaches. The Apaches bear a striking resemblance to the Tartar. About the year 1885, W. [William] B. Horton, who had served as County Superintendent of Schools, at Tucson, was appointed Post Trader at Camp Apache, and went to San Francisco to purchase his stock, where he hired a Chinese cook. His kitchen adjoined his sleeping apartment, and one evening while in his room he heard in the kitchen some Indians talking. Wondering what they were doing there at that hour of the night, he opened the door and found his cook conversing with an Apache. He asked his cook where he had acquired the Indian language. The cook said: 'He speak all same me. I Tartar Chinese; he speak same me, little different, not much.' At Williams, in Navajo County, is another Tartar Chinaman, Gee Jim, who converses freely with the Apaches in his native language. From these facts it would seem that the Apache is of Tartar origin. yuàn mí de zhǐyì fèngxíng zài rénjiān, rútóng zài tiānshàng. dàn jiù wǒmen miǎnyú xiōng'è. NohwiTaa yaaká'yú dahsíndaahíí Nizhi'íí dilzîhgo bígózîh le'. Hagot'éégo ánniiyú yaaká'yú benagowaahíí k'ehgo ni'gosdzán biká'yú alhdó' begodolníílh. Díí jîî daahiidââ doleelhíí nohwá ágonlhsî. Hadíí nchô'go nohwich'î' ádaaszaahíí bighâ baa nágodent'ââhíí k'ehgo néé alhdó' nchô'go ádaasiidzaahíí bighâ nohwaa nádaagodin'áah. áídá nchô'go at'ééhíí bits'â'zhî' hanánohwihi'níílh. lha'íí ízisgo ánt'éhi dahazhî' bee sínzîî doleelh. The two languages are obviously completely unalike. While old stories like the above might be useful as an illustration of mutual intelligibility of two languages already known to be closely related, or as evidence pointing to a particular genetic affiliation of a long since dead language about which little or nothing is known, it is hardly possible to cite such anecdotes as "proof" that speakers of two languages that are still very much alive and that are known to be totally unrelated and mutually unintelligible can communicate with each other. Indeed, there is a significant body of texts in Apache  which clearly shows a language totally dissimilar to Chinese. A time span of slightly over a century is insufficient to obliterate any trace of relationship between what were initially mutually intelligible dialects. There are multiple possible explanations for the discrepancy between Farish's anecdotes and the attested history of Apache. First, Farish might have simply misremembered the stories. He does not clarify the sources of the anecdotes; he may have witnessed them personally, read them in books or articles, or heard them from someone else. It is entirely possible that the original accounts did not involve Chinese-speaking Apaches, but merely acquired this form in Farish's mind over time. This seems possible, given that Farish apparently does not have first-hand knowledge of the languages in question. Alternatively, the so-called "Tartar Chinamen" may in fact have been Navajo and/or Apache pretending to be Chinese, for whatever reason. Perhaps they were playing pranks on unsuspecting outsiders, in which case they probably laughed heartily at the men's gullibility. Map 1: Treaty-imposed territories. Navajo (orange), and Apachean languages (other colors). The ability of "Gee Jim" to communicate with the Apache may also be explainable by the fact that Navajo is quite close to Apache. Consider the maps on the right, which show the current and historic territories of Navajo and various Apachean languages. As can be seen, Navajo is geographically quite close to Apache; in addition, Navajo County and Apache County are adjacent to each other. 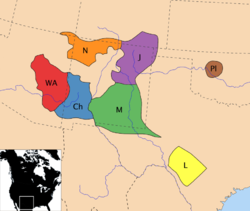 One site dealing with Native American languages states: "Actually, there are at least two distinct Apache languages: Western Apache and Eastern Apache. The two are closely related, like French and Spanish, but speakers of one language cannot understand the other well–in fact, Western Apache is closer to Navajo than to Eastern Apache." In other words, Apache is fairly similar to Navajo. The ability of Gee Jim (a Navajo County resident) to communicate with the Apache may be because of his actually being a Navajo; communication may have been possible due to the similarity of Navajo and Apache and/or his being able to speak both languages. It's not as if linguists are closed-minded dogmatists who categorically refuse to consider any evidence that might significantly change their picture of Amerindian linguistics. For instance, the linguist Edward Vajda has proposed, on the basis of comparative evidence, that the Na-Dene languages (which include Apache) are related to the Yeniseian languages of Siberia, a proposal which has met with not insignificant approval within the linguistics community. If linguists are capable of coming up with and seriously considering the idea of Apache being distantly related to obscure Siberian languages with very few speakers, it is not likely that they would completely gloss over something as obvious and in-your-face as Apache being identical to Chinese. Trump cited Menzies' 1421 book as one of the books he had "read" that indicated that he "understood" the Chinese. ↑ History of Arizona by Thomas Edwin Farish, 1918, Volume VII, Chapter I. Indians of Arizona. ↑ William B. Horton, de.wikipedia.org. ↑ Donald Trump has read a lot of books on China: 'I understand the Chinese mind' by Tony Pierce (May 3, 2011 | 4:05 pm) The Los Angeles Times. This page was last modified on 4 October 2018, at 10:01.